The Spanish Transition to Democracy – A Missed Opportunity for the Left? The end of the Southern European dictatorships in the mid-1970s – Salazar’s successor Caetano in Portugal, who was overthrown in 1974, and Franco in Spain, who died in 1975 – opened a period of democratic transition and a ferment of political debate and action. The purpose of this study is to analyse the factors influencing the strategies of the left, and particularly the Spanish Communist Party (PCE), during the period from the April 1974 revolution in Portugal to the victory of the Spanish Socialist Party (PSOE) in the 1982 general elections. It is based primarily on recorded interviews with participants in the events in question – the opposition movements during the dying days of the Franco regime and the transition to democracy that followed the dictator’s death. In the aftermath of the 1936-39 Civil War, the opposition to the Franco regime was decimated: slaughtered in their tens of thousands or driven into exile or hiding1. However, in the late 1950s, and with a period of prolonged economic growth in the 1960s, the confidence of Franco’s many opponents began to return. As the dictator gradually loosened his iron grip on state institutions such as the unions, opportunities for opposition, led by the Communist Party, multiplied. Though the party’s leadership had been driven into exile – either in Eastern Europe or France – it did maintain a clandestine network of activists inside the country, who were able to take advantage of Franco’s increasing age and decreasing popularity among the businessmen and church leaders on whom his regime had traditionally relied. The opposition movement broadened in its social base, and the pace and size of its mobilisations increased, in the early 1970s. The only significant, organised party within that opposition movement was the PCE. With Franco’s death in 1975, the opposition, and the PCE, faced some stark strategic choices. Would they continue to attempt to bring down the dictatorship by mass mobilisation,2 or would they try to reach an agreement with the moderate, relatively liberal wing of Franco’s movimiento?3 Would they confine their demands to democratisation, or aim to achieve social change at the same time? With some notable exceptions4, historians have rarely looked at what lay behind the decisions taken on these questions, which have played a determining role in the last 25 years of Spanish history. Still less have they tried to base their research on the views and memories of the participants themselves. f) how the strategy followed by the party from 1975-79 affected the PCE crisis of membership and electoral support in 1982. For the purposes of comparison, and in an attempt to achieve some degree of objectivity, the sample of interviewees was carefully chosen to represent a variety of political, social and geographical origins. Not only members of the PCE were interviewed, but also opposition activists from other left-wing currents and trade unionists who had never belonged to any party. Not only leaders of the organisations in question were approached (as is so often the case), but also rank and file members. Additionally, the sample was split between the two main centres of opposition activity, Madrid and Barcelona. Inevitably, by comparison with large scale or documentary-based projects, small group research will lose something in sociological representation, but will gain in its ability to give more weight to the experience of the individual. The fundamental criterion for the selection of interviewees used by the FPM (First of May Foundation – a union-funded research institute) was that all interviewees had to have been actively involved in the anti-Francoist opposition during the period of the transition. In addition, the FPM was asked to ensure that the interviewee group provided a mix of political backgrounds and a reasonable male/female balance. Just over half the interviewees began their political involvement in a union organisation, generally the state union or the Comisiones Obreras (CCOO), the communist-influenced federation. A third became politically active through a student organisation (a student union, or communist/socialist student groups). The overwhelming majority – over 80% – had had family members involved in the Civil War in one way or another. Some 75% had been members of the PCE (though some had left or been expelled), while 25% had never been members – either due to involvement elsewhere, or rejection of direct political involvement. Of those that had been in the PCE, some 62.5% had been ordinary members, while some 37.5% had been members of the leadership (either Central or Executive Committee). In the final years of the Franco regime, the PCE’s strategy for mobilising the opposition – generally thought to be one of its greatest successes – centred around the ruptura democrática, a democratic break with dictatorship, through the means of a general strike. For years the party, led by Santiago Carrillo since the 1950s, but who had remained in exile until 1976, had planned a peaceful national strike. Now this was included in the ruptura which in 1973 the PCE had defined thus: “The step from dictatorship to democracy has to happen through a real political revolution. Through our struggle, through the struggle articulated by the forces in favour of democracy, the task that we propose is to carry out a political revolution…. The PCE’s proposals will facilitate the step from fascist dictatorship to democracy…with the least violence possible and the elimination of the danger of a new Civil War… On repeated occasions the communists have said that a National Strike could finish with the dictatorship. Interviewees felt without exception that the strategy had been enormously successful in terms of mobilising the opposition, and weakening the Franco regime. A typical comment from a Madrid councillor for Izquierda Unida (IU), in 1977 an ordinary member of the PCE and CCOO, was: “I always thought so – that it was a successful strategy. I was very involved in the labour movement. …At that time there was an enormous effervescence in Spain and the whole of the left were acting behind the PCE. Also, the left were prepared to participate in a general strike, which the party had continuously been telling us was what we were going to do. I think we were prepared, the workers, to carry out that strike.”9 However, the dictator died in his bed and the political situation – including the PCE’s strategy – began to change. The first year after Franco’s death offered a very different picture from that of mass action described in the PCE’s manifesto. The party, still illegal and concerned that it would be marginalised from the transition process, moderated its traditional strategy. For more than 20 years it had had a strategy for transition based on mass mobilisation – first the peaceful national strike10 and then the ruptura democrática (democratic break). This had been the basis of the Junta Democrática, one of the main opposition organisations, which the PCE had launched.11 Now the party decided that the strategy was no longer viable, and should be replaced with the ruptura pactada, a break with Francoism negotiated at elite level, in parliament, rather than by mass action. The party knew its legalisation was on the cards in the near future, and that shortly thereafter there would be parliamentary elections. Despite the ferment in the aftermath of Franco’s death, they felt that the opposition organisation had to be broadened through uniting with the Plataforma Democrática, the more moderate, socialist-influenced opposition coalition. This was the first step towards a strategy based on rapprochement with the other “democratic” parties. However, both explanations beg the question of why the opposition inclined towards reformism and were willing to change strategy. Fishman tends to attribute the reasons to “key actors”. This has some validity, in that figures such as Carrillo were enormously influential, but the former PCE leader himself suggests that his hands were tied by a degree of popular passivity rooted in fear. This view may have coincided with his ideological leanings, but the inability to mobilise more widely suggests a factor located not just in the opinions of “key actors”, but more widely affecting the mass of pro-democracy activists. Fishman does not seem to ask respondents how they would have acted in different circumstances, but how they assessed the process some five years later, and these are rather different things. In terms of ideology, the PCE had a justified reputation for its independence from Moscow, having played a leading role in the Eurocommunist movement. Nonetheless, its strategy in the transition tended to rely increasingly on negotiation between elites rather than mass mobilisation. The PCE grew enormously out of the initial burst of enthusiasm when the party was legalised – in the three years from 1975 to 1978 it claimed an increase in membership from 15,000 to 240,000. The PCE-influenced union, CCOO, also experienced rapid growth in the early days of transition. However many of these were to leave in the next few years, as feelings of disillusionment and betrayal replaced the euphoria of the early days. It is perhaps understandable that immediately following Franco’s death, the majority of the PCE’s activists and leadership should assume that it was set to play a leading role in the country’s politics. In January 1977, a few months before the elections, the party journal summed it up thus: “We are going to win the elections so that the people can recuperate sovereign control over their own destiny, and open the way to socialism and freedom… We are – every observer agrees – the main party of the working class. Winning millions of votes for the PCE’s candidates is a realistic objective given our influence over broad sectors of the people.”17 Given its forty years as the only significant party opposing Franco from inside Spain, its strength in the trade union movement and the Junta Democrática, this was at the time a reasonable expectation. However, it was also conditioned by the party’s ideology and the experience of its overwhelmingly powerful leadership. In other words, the party leadership’s main premise was that the future Spanish political landscape would replicate the situation in Italy following the Second World War. By the 1970s Italy had the strongest Eurocommunist party in Europe, and the Italian CP was the main political influence on the PCE’s ideology. Thus there would be a right wing party and a strong Communist Party, with social democracy playing a relatively unimportant role as a third party. This was premised on the fact that Spanish social democracy had more or less ceased to exist as an organised force after the Civil War. Yet this idea demonstrates what Francisco Frutos, the current PCE leader and then a leader of the party organisation in Catalonia, refers to as Carrillo’s “gaps in experience” – perhaps his long period in exile. Given the traumatic experience of the Civil War, in which the PCE had been one of the main protagonists, followed by forty years of indoctrination about the evils of communism, it was always more likely that a new force on the left, with no direct memories of the war attached to it, would win support. In the same way, the UCD (Union of the Democratic Centre) won the role of major party of the right. It is worth noting that a number of interviewees felt that that the anti-Communist culture created over the decades of Franco’s rule was more important than any direct fear of violence. It is also striking that the two parties that dominated Spain during the transition – the PSOE and the UCD – had been absent, or non-existent, in the years since the Civil War. This was one error. A much greater error was the party’s failure to recognise, after the first elections, that it had no short to medium-term future as a governmental party. Here the influence of Carrillo’s adherence to his own particular version of Eurocommunist ideology can again be seen at work. The doctrine of winning power from within the structures of the bourgeois state, a central tenet of Eurocommunist ideology, was precisely what Carrillo was trying to do. Yet as his recent successor as Communist leader, Francisco Frutos,18 has pointed out, this was hardly a realistic possibility with 10% of the vote. The strategy of the “gobierno de concentración”, the cross-party “national government” in which Carrillo hoped the Communists could play an influential role, never stood the slightest chance of success. Neither of Carrillo’s interlocutors – Suarez, leader of the moderate right wing UCD and Prime Minister or Felipe Gonzalez, Socialist (PSOE) leader – was interested. It should have been clear that the primary strength of the PCE was not going to be in parliament, but in its activist base. These factors can sometimes coincide, but in the PCE from 1979-82, this was not the case. While it had only a fraction of the vote of the major party – the UCD – the PCE had a considerably larger membership. In the first two general elections it had less than a third of the UCD’s vote (9% to 35%), whereas the proportions are reversed when we look at membership figures: over 200,000 for the PCE compared to 75,000 for the UCD.19 The PCE also had enormous support within the strongest wing of the trade union movement, the CCOO. Thus if it was not clear before, at least by the 1977 elections it should have been obvious that the route of the “obsession with pacts” (Francisco Frutos) would destroy the greatest strength that the party possessed. The majority of authors on the subject state that there was little or no appetite for revolution in Spain at the time. This is true, though this was not necessarily the only other option. Had the PCE and the CCOO continued to mobilise – and all the evidence prior to the freno22 suggested that the numbers and momentum were increasing – it is quite possible that the party could have found a role as a more significant radical left minority.23 In those circumstances it is quite conceivable that it could have pressured its interlocutors to deliver a more radical “social transition” along with the democratic reforms. The factor that Carrillo mentions as the downfall of the ruptura democrática strategy – fear based on collective memory and the violence of the “sector duro” (hard right) – was also not necessarily a constant. It may well have been conditioned by the party’s own decision to demobilise in the late 1970s as a counterpart of its coalition policy. The atmosphere of violence mentioned above was very much one of the defining features of the Franco regime. The regime began the post-Civil War period with the massacre of up to 200,000 Communists and progressives, a veritable reign of terror. This potential for violence, and the fact that the roots of the regime lay in the Civil War, was something constantly referred to by Franco in public speeches. In addition, Communist activists were executed – usually by garrotte – with considerable publicity right up to 1974. However in the area where mobilisation was strongest, Barcelona, interviewees reject the idea, widely accepted elsewhere in Spain, that fear was a significant factor affecting the left. As a consequence, in Barcelona nearly twice as many CCOO organisers felt that “a historic opportunity was lost to create a more advanced democracy on the basis of popular mobilisations” (Fishman) as in Madrid. In the 1977 elections, the proportion voting Communist in Barcelona was almost twice the national average. It is possible that the party’s unity and support was strengthened by the fact that in Barcelona there had not been significant support for Francoism, either during or after the Civil War. Despite the harsh repression the Franco regime had meted out in Catalonia, that unity may have been enough to overcome fear of further violence. In contrast, the population of Madrid, one of the party’s other strongholds, had been deeply divided during the conflict. This view is reflected in contemporary studies of the psychological effect on individuals of involvement in collective action. Thus, for example, Kelly and Breinlinger note that “For strong identifiers (with the cause/action), participation in the collective action – doing something positive – is central to their social identity… and calculation of costs and benefits are of less significance… The more active… felt that they had become more aware, and more angry … had developed a stronger belief in collective action… and also learned how to deal with groups more effectively, gained self-confidence…”29 Thus it seems quite possible that this heightened self-confidence and belief in collective action could have mitigated any fears over reprisals. Collective memory is of course a complex phenomenon. It is not just a memory passed on, unchanged by contemporary events or the passing of time. However, in Spain, not only had a very high proportion of the participants in the democratic movement had family members directly involved in the Civil War, but the Franco regime had continued the violence against the left. It continually reminded the population that his regime was founded on the victory over the Republicans in the Civil War. In terms of Suarez’s aims – the consolidation of a stable, capitalist democracy – this was necessary. However, the PCE’s main strength was its large number of organised activists, whereas the fear of violence was an electoral disadvantage. For the PCE – and for any hope of social, as well as political, reform – the moving of the locus of political action from the street to the parliament chamber may have been the beginning of its downfall. The party’s decline after 1979 was reflected both in its membership and its votes in general elections. The party’s membership growth had continued, increasing from 201,000 to 240,000 between 1977 and 1978, and its popular vote had grown from 9.4% to 10.8% between 1977 and 1979. However, by 1979 membership had fallen to 140,000 and 85,000 in 1983; while its popular vote slumped to only 3.8% in the 1982 elections.33 These elections were a triumph for the PSOE, giving Spain its first Socialist government, but saw the PCE at its nadir. The potential dangers of the party strategy had been revealed, and internecine strife burst into the open, with various factions splitting from the party and Carrillo finally deposed. Surveying Spanish Communist organisations in the mid-1980s, R. Gunther has argued convincingly that roots of the ex-leader’s downfall lay in the fact that the combination of his political line and his internal leadership style left him vulnerable to attack from both wings of the party. Thus “…from one side, Carrillo received support from the youngest communists, who favoured his ideological and strategic reforms, but later questioned his authoritarian style of leadership … many older communists, on the other hand, opposed his eurocommunist ideology, but showed respect for him due to the tradition of democratic centralism. At the end of the day, Carrillo was to see himself attacked by both sides.”34 As the PCE increased its efforts to emphasise its moderate image, it appears to have become less and less obvious to voters why they should choose the Communists at the ballot box rather than the more credible governmental option of the PSOE. The PSOE’s impressive score at the first democratic elections (given its absence during the Franco years) meant that any prospect of a left-orientated government increasingly lay more with the Socialists than the Communists. Some Communist militants undoubtedly felt that the party had sacrificed too much during the negotiations over the Moncloa Pacts, and trade union officials also spoke of being marginalised from the process. For some the most important part was the symbolic acceptance of the monarchist flag, for others the fact that Carrillo and others had signed up to salary limits with very little attempt to consult those it would affect. Yet it was probably a fairly small minority that felt this sense of betrayal in the aftermath of the Accords. Some of them left to form the Partido Comunista de los Pueblos de España (PCPE), a fairly small pro-Soviet split (though with some union influence) established in 1984 by Ignacio Gallego.36 Overall, this sense of betrayal principally affected “cadres” – party organisers, those most ideologically committed to the party. It is quite likely that a major part of the PCE vote deserted to the socialists out of sheer pragmatism. Given that by 1982 it had become clear in two general elections that the PSOE was the only serious governmental contender on the left – and a left government was the overwhelming priority – many of PCE’s voters probably took this option. As Frutos put it, the return of the left to government was “the left’s revenge for 1939, the defeat of the republic.”37 However this does not adequately explain the rapid desertion of the 50% of the party’s membership – a decision to vote tactically for a party with a greater chance of electoral success does not necessarily imply that one leaves the party to which one is ideologically affiliated. Here it has been suggested that in the heady days of euphoria following the dictator’s death, many of those that flocked to the PCE’s ranks were not in reality communists. Given the PCE’s prestige, referred to above, as the only party maintaining an organised opposition during the Franco years, it has been suggested that many of those committed to the democratic opposition – a hodgepodge of radicals, liberals and anarchists of various stripes – joined the party as a symbol of democracy rather than as a statement of ideological affiliation. Once it seemed that democracy had been installed and stabilised to some extent, many realised that their political views corresponded more to those of the PSOE, or simply dropped out of organised politics altogether. To some extent that was perhaps inevitable, but also partly a function of the party’s inability to integrate the enormous numbers that flowed into the party in 1976-77. With at least a tenfold growth over two years, the PCE’s apparatus was swamped. A party with only 15,000 members before its legalisation simply did not have sufficient experienced militants, let alone party structures, to integrate and politically educate its new membership in anything but the most perfunctory way. This was probably aggravated by the fact that the party’s leaders were devoting their attention increasingly to parliamentary matters rather than strengthening the ideological basis of the party. Finally, a number of ordinary PCE members attribute the sharp decline in the party’s support to their disillusionment with various aspects of its political line. For some, this relates to the party’s loss of momentum following its decision to order a halt to street and trade union mobilisation after the 1977 elections. Of those that were prepared to go along with this, many felt that the party’s 1982 election campaign was the final straw. It had become increasingly clear that neither the PSOE nor the UCD were interested in Carrillo’s proposal of coalition government. Portugal – echoes of the revolution in Spain? “Since he was the longest-standing dictator in Europe and it was a part of the Iberian peninsula, we were proud that the people could finish him off and it was a stimulus to increase our struggle. If Salazar could fall, well, why not Franco?”40 However, it seems that many ordinary members were not very conscious of exactly what was happening in Portugal – the movements of peasants and landless workers, the provisional governments – and few had any memories going beyond the feelings of exhilaration and solidarity mentioned above. However, although this was the general sentiment expressed in the party paper, Mundo Obrero, at the beginning, differences with the Portuguese party’s tactics soon became public. Carrillo commented “To my way of thinking the counter-position between Western democracy and popular democracy in Portugal is a position full of danger. If it was a question of a counter-position between the Western model, dominated by monopoly capitalism, and the socialist model of a one-party state as in the East, the consequences could be a ‘great leap forward’ or a retreat, both negative. I don’t want to interfere in internal Portuguese affairs…”42. In a slightly oblique way, the Spanish leader was polemicising against the revolutionary positions represented by the Portuguese party, insinuating that their politics would lead to something similar to the excesses of Maoism. If Carrillo was not attempting to intervene directly in Portuguese affairs, he certainly did want to make it clear that nothing similar would happen in Spain. In the following month, in an article entitled “The change has already started”, he spelt it out. Indeed, if one takes Adolfo Suarez’s UCD to be the embodiment of this civilised right, nothing similar had existed since at least the 1930s, and after the few years of the transition, it again disappeared – after winning the 1977 and 1979 elections, in 1982 it descended from 168 seats to just 12. 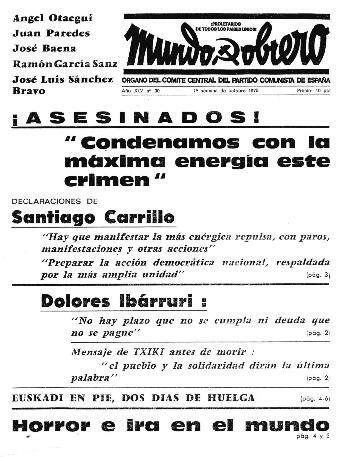 A victim of its own political incoherence, the party was disbanded the following year.45 Spain was left with the Alianza Popular (now Partido Popular) to represent the interests of the right – presumably precisely the uncivilised right that Carrillo was trying to distinguish from the UCD. In the 1970s and early 80s, AP was not seen as a legitimate, constitutional party of the right, as its successor is now; it was seen as the ideological inheritor of Francoism. The collapse of the UCD, with the bulk of its forces deserting to either the PSOE or the AP, emphasised its fragility and dependence on its key elite figures.46 Carrillo’s privileged relationship with Suarez, the importance of which is emphasised by Claudin,47 was certainly key to the transition. However, the idea that a grand coalition with the “civilised right” represented any kind of medium or long term strategic option was a mirage. This is where the truth of Frutos’ comment – that Carrillo was a “quick dribble player – not deeply thought out” is evident. However, it was a fact that was to cost the party dearly over the next few years. It is strangely mirrored in Spain’s UCD president at the time, Adolfo Suarez, with whom Carrillo always had a close relationship. Hopkin emphasises how the politics of consensus that governed in the days of the Moncloa Pacts – and that Carrillo saw as the key to a future central role for the PCE – crumbled in the days following the 1979 elections.48 Whereas the elaboration of the constitution had demanded cross-party collaboration, these days had passed, and both the PSOE on the left and AP on the right saw that distinctive political programmes and identities had to be forged. Having realised this, they asserted their own political identities, and promptly attacked the UCD. Perhaps a part of the explanation lies in the presidential model both parties adopted (de facto, if not in principle) – where individual leaders could have disproportionate effects on the party – and certain similarities in the two leaders’ characters. A description of Suarez by one of his senators in this situation strangely mirrors Frutos’ description of Carrillo (above) “… a person with great political instinct, but perhaps lacks a medium or long term idea of how things should be organised…”.49 Perhaps the similarity between the two men as political leaders went deeper than has been imagined; both were impressive leaders in times of crisis and upheaval, but less than adequate in a situation of more everyday political competition. Among the many studies of that disparate phenomenon known as Eurocommunism, few have focused on the fact that the late 1970s and early 1980s provided us with a unique opportunity: to see an influential party, led by one of the leading lights of the Eurocommunist movement, playing a major role in regime transition from dictatorship to democracy. The situation with which Carrillo and others attempted to grapple was undoubtedly a complex one. As I have tried to show, there seems to be no doubt, for example, that the memory of the Civil War had a significant effect on Spanish political consciousness at the time. However, that does not necessarily mean that Santiago Carrillo’s hands were tied, as he claims. Many of his co-leaders and activists appear convinced that an opportunity was lost to push Spain in the direction of progressive social change as well as democratic reform. To what extent the PCE’s strategy was determined by Carrillo’s own certainty in his “national unity” strategy, and to what extent he may have been manipulated by the wily Suarez, is difficult to ascertain. Yet what certainly seems questionable is the judgement – assumed by some leading historians to be self-evident – that Carrillo’s actions are to be applauded because they gave Spain “stability”. Given that we are discussing a party that inspired millions with the promise of social change throughout the Franco years, the stability of the social order is hardly the best benchmark for judging it. In addition, whatever other factors may have played a role in the party’s decline, it seems difficult to avoid laying at least some of the blame for the electoral and membership crisis at Carrillo’s door. This is not just a matter of historical research, for the question of democratic transition remains on the agenda today. For those that would like to see not just the extension of democracy, but also progressive social change, there are lessons to be learned. There may be great dangers in demobilising a people enthusiastic for social change, purely on the basis of democratic “legitimacy”. A party with a strong activist base among the organised working class may run serious risks of losing opportunities for social change when it orders that base off the streets, purely on the basis of hopes of participation in elite negotiations. Surely experience tells us that in the vast majority of cases, such a course will tend to favour the interests of the social classes already in power. This is not to question parliamentary participation – far from it – but to question sacrificing the potential power of extra-parliamentary mobilisation in pushing for social change at the same time, in the hope of concessions from those in power. Historians cannot say what would have been the course of events in Spain had the PCE continued its campaign of mass mobilisation in the late 1970s. However, many of those involved believe that a more radical, social transformation could have been a real possibility if parliamentary work had been combined with mass mobilisations. For those involved in democratic transitions around the world in the 21st Century, the experience of Spain in this fascinating period is sure to hold many valuable lessons. Santiago Carrillo, Dialogue on Spain, Lawrence & Wishart, London, 1976. Robert Fishman, Working Class Organisation and the Return to Democracy in Spain, Cornell University Press, 1990. Paul Heywood, The Government and Politics of Spain, Macmillan, London, 1995. J Hopkin, Party Formation and Democratic Transition in Spain, Macmillan, London, 1999. Juan José Linz & Alfred Stepan, Problems of Democratic Transition and Consolidation, John Hopkins UP, London, 1996. P McDonough, S Barnes, & A López Piña, The Cultural Dynamics of Democratization in Spain, Cornell University Press, Ithaca (New York), 1999. Victor Perez-Diaz, Spain at the Crossroads, Harvard University Press, Cambridge (Mass), 1999. Paul Preston, The Triumph of Democracy in Spain, Routledge, London, 1996. Michael Richards, A Time of Silence, Macmillan, London, 1999. José Luís López Bulla 12-5-99 Granada. CCOO=Comisiones Obreras/ (main, pro-communist union federation /CONC in Catalunya); Sind Vert=Sindicato Vertical (state union); Assoc Vec=Associación de Vecinos (Neighbourhood Organisation); Org Univ Estatal=State University Organisation; Univ=university; Sind Dem Est=Sindicato Democrático de Estudiantes; UJCE=Unión Comunista de Juventud Universitaria (Communist Student Organisation); Juv Com=Juventud Comunista (Communist Youth); FRAP=Frente Revolucionaria Antifascista y Patriótica (violent, pro-Maoist opposition group); Org Est Soc=Organización Estudiantil Socialista. PC=Partido Comunista; Mil b=Militante de base (Ordinary member); CC=Comité Central; CE=Comité Ejecutiva; LCR=Liga Comunista Revolucionaria (trotskyist); ORT=Organisación Revolucionaria del Trabajo; FLP=Frente de Liberación Popular (left wing coalition); PSUC=Partit Socialist Unificat de Catalunya (Catalan Communist Party). 1. See, for example Michael Richards, A Time of Silence, CUP, Cambridge, 1998. 2. This was the strategy of the ruptura democrática, a “democratic break” based on the idea of a one-day strike by unions, opposition parties and civic organisations to bring down the authoritarian regime. See the section on “Communist Strategy in the Transition” for the PCE’s definition of the ruptura democrática. 3. The movimiento was the single party formed by Franco in the 1940s from his cronies that initally acted as his mouthpiece and implemented his commands, but later, in the 1960s, became broader with increasing room for dissent. The reality was that the while in the early period the bourgeoisie was more or less united behind Franco, in the latter days many businessmen had come to question whether a dictatorship that isolated them from Europe was really in their best interests. 4. E.g. Robert Fishman, Working Class Organisation and the Return to Democracy in Spain, Cornell University Press, 1990. 5. For this I am grateful to the University of London Central Research Fund and the History Department at my own college, Queen Mary & Westfield, for their financial support. It would not have been possible without the considerable support afforded by the Fundación Primero de Mayo research institute, which selected the interviewees, of Prof. Jaime Pastor of the Universidad Nacional de Educación a Distancia, who supported and aided the project in a range of areas, as did my PhD supervisor, Prof. Donald Sassoon. I would also like to acknowledge the aid of the PCE Archives and the School of Advanced Studies in Social Sciences of the Fundación Juan March, both of which made their resources available to me. 6. Luisa Passerini, Fascism in Popular Memory, CUP, Cambridge, 1987. 8. From “Proyecto de Manifiesto-Programa del PCE, 1973” in PCE en sus Documentos 1920-1977 ediciones hoac, Madrid, 1977. 9. Author interview with Maria-José Gallego, Madrid, 30-4-99. 10. For example Claudin cites Carrillo calling in 1956 for “A strike, starting wherever, which will rapidly extend to every major urban centre and create a revolutionary situation in the country.” Fernando Claudin, Santiago Carrillo – Cronica de un Secretaria General, Editorial Planeta, Barcelona, 1983. p. 133. 11. The Junta Democrática was launched in 1974 and included a range of socialists, trade unions and others, but was led by the PCE. Its programme called for a provisional government; a political amnesty; the legalisation of political parties; trade union freedom and the right to strike; freedom of speech, the press & the media; separation of Church & state; independence of army & judiciary; free elections. 12. Author interview with Santiago Carrillo, Instituto Cervantes, London; 12 December 1997. 13. For example, Carrillo says “We knew that in Europe not only would they not tolerate that … Spain end up in a socialist situation; the English, the French, the Germans, the Americans wouldn’t tolerate it. We knew there were limits beyond which we couldn’t go.” ibid. 14. Fishman, op. cit. p. 142. 16. Author Interview with Francisco Frutos, 15-7-98. 17.Mundo Obrero, 24/1 – 13/2, 1977 – “Ganar las elecciones para la democrácia”. 18. Francisco Frutos became PCE leader in 1999. Carrillo remained in office until 1982, when he was replaced by Gerardo Iglesias. Iglesias was replaced by Julio Anguita (now a leader of Izquierda Unida) in 1988. 19. J Hopkin, Party Formation and Democratic Transition in Spain, Macmillan, 1999, p. 103. 20. Paul Preston describes the pacts thus “…the Pact aimed to establish a common response to the problems of terrorism, inflation, unemployment and the growing trade deficit. … (it) was in many respects the culmination of the policies of moderation and self-sacrifice pursued by both the Socialists and Communists throughout the transition period.” Paul Preston, The Triumph of Democracy in Spain, Routledge, 1996. pp. 136-137. 21. Author Interview with Luís Maria Gonzalez, 29-4-99, Madrid. 22. The freno (brake) was the PCE-imposed halt in 1977 on strikes and street mobilisations to try to convince their interlocutors of their moderation – and therefore the case for cooperation. 23. For example Mundo Obrero 9-15 May, 1977, estimates that over 5 million took part in actions to celebrate International Workers’ Day, despite repression. 24. FIM, Para una historia del PCE, FIM, Madrid, 1980. p. 188. 25. Author interview with Marcelino Camacho, 21-4-99, Madrid. 26. Author interview with Maria-Jésus Vilchez, Madrid, 27-4-99. 27. The Atocha killings occurred on the eve of the first general elections in January 1977 in Madrid. Three Communist labour lawyers were murdered, almost certainly by Francoist military elements. The “Tejero Coup” was a failed coup attempt in 1981 in which a small number of soldiers led by a Colonel Tejero briefly took over the parliament building in a last gasp of Francoism. It appears almost farcical in retrospect, but not if one was in Spain at the time, with a democracy as yet very unsure of its stability. 28. Author Interview with José Casado, Madrid, 22-4-99. 29. C Kelly & S Breinlinger, The Social Psychology of Collective Action, Taylor & Francis, London, 1996. Pp 44-46. 30. Marion Sarafis & Martin Eve, Background to Contemporary Greece, Merlin Press, London, 1990. Vol 2, pp. 249-250. 31. Linz & Stepan, “The Paradigmatic Case of Reforma Pactada- Ruptura Pactada: Spain” in Problems of Democratic Transition and Consolidation, John Hopkins UP, 1996. pp. 94-96. 33. All figures from E. Mujal-Léon, “Decline and fall of Spanish Communism”, Problems of Communism, March/April 1986, pp. 1-27. 34. Richard Gunther, “Los Partidos Comunistas de España” in Juan José Linz & J Montero, Crisis y Cambio: Electores y Partidos en la España de los años Ochenta, CES, Madrid, 1986. p. 501. 36. For more details on the PCPE see Mujal-Léon, op. cit., pp. 18-26. Ironically they ultimately joined the PCE-dominated Izquierda Unida. 38. Author interview with Luís-Maria García, Madrid, 29-4-99. 39. Author interview with Begoña San José, Madrid, 23-4-99. 40. Author Interview with Rafael Léon, Madrid, 20-4-99. He is of course speaking about the Salazar regime in a general sense, given that the dictator had handed over power to Caetano in 1968, and it was him that was overthrown in 1974. 41. Author Interview with Julián Ariza, Madrid, 19-4-99. 42. Mundo Obrero, 2a semana, Abril de 1975. 43. Mundo Obrero, 1a semana, Mayo de 1975. 44. Interview with Luís-Felipe García-Calvo, 6-5-99. 45. For an interesting analysis of the history of the UCD, see Hopkin, op. cit. 46. See ibid, pp. 239-240. 47. Claudin, op. cit. See for example p. 247. 48. Hopkin, op. cit., pp. 122-125. 49. Cited in ibid, p. 130.